What is the meaning of COME UP? If an event is coming up, it is going to happen soon, at a planned time in the near future. My vacation is coming up next week! That meeting came up quickly. I didn’t allow enough time to prepare for it. 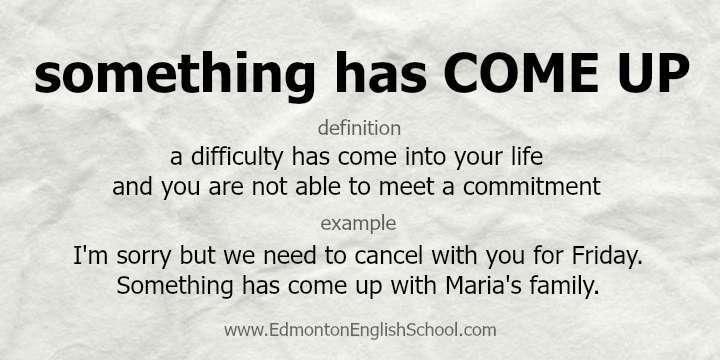 See example of come up: Coming up, in Part 5, we give you five things you can do to start improving your English right now. If a person (or animal) comes up to you, they come directly to you; they come close to you. The other day, on the street, a stranger came up to me and asked if I was his cousin. I hate the way your dog always comes up and smells my shoes! This expression can be used when you do not want to give a lot of details about the difficulty because it is private. I am sorry that we won’t be able to attend the work party on Friday evening as we had planed. Something has come up with my family. That was John on the phone. He said not to wait for him because something has come up at work and he can’t get away. This definition is mostly used to talk about plants growing. Use this phrasal verb when the new growth starts to show above ground. I love spring. The tulips in my flower bed are starting to come up. I planted carrots this year. I hope they come up soon. Oh, look! The crocuses are coming up.